This is a beautifully illustrated look inside the fascinating world of creepy-crawlies, with stunning three-dimensional pop-ups. 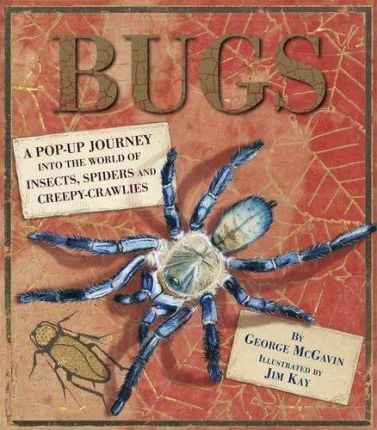 Larger-than-life bugs spring from the pages, peek out from behind flaps and hide under tabs, inviting young entomologists to marvel at the mind-boggling variety of arthropod life. What reader can resist is a chance to look inside a cockroach's body to see how it works or open a wasps' nest to see what's inside? Useful information (why does the world need bees?) and scientific trivia (which beetles are strongest and fastest?) pack every page, while exquisite art and dramatic pop-ups bring the world of bugs to life. This is an ideal gift for nature lovers of all ages. George McGavin is an author, lecturer, television presenter and explorer. He is an Honorary Research Associate at the world famous Oxford University Museum of Natural History and The Department of Zoology of Oxford University. He has several insect species named in his honour and hopes they survive him. George lives in Ascot, Berkshire. Jim Kay is the illustrator of the Flaxfield Quartet and won the Kate Greenaway Medal for A Monster Calls, in which he used everything from beetles to breadboards to create interesting marks and textures. He lives in Kettering, Northamptonshire.